The property consists of three non-contiguous parcels of patented lands totaling 131 acres. Proven Gold Reserves: 673,871 oz. The property also contains significant amounts of Silver and Copper that has not been explored. Property comes with VESTED RIGHTS: The mine only needs a new Reclamation Plan for Approximately $100K to begin the mining process. Vested Rights are transferrable to any new buyer. The property is Permit-able to have processing take place on site. 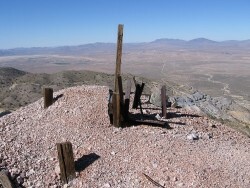 The site lies along Blackhawk Canyon, above the famous Blackhawk Landslide in a remote location in Lucerne Valley, San Bernardino County, California, USA. Access to the mine is nine miles east of Lucerne Valley, California, on State Hwy 247. Then proceed south 5 miles on Santa Fe Fire Trail road to the mine site on the north slope of the San Bernardino Mountains. To mine in California you need a Conditional Use Permit or Vested Rights and an approved Reclamation Plan. The Blackhawk Mine site has Vested Rights and a Reclamation Plan approved in 1983. The site is a remote, historical mining district, with no neighbors. The Blackhawk property has historic and significant gold potential. The site has recognized Vested Rights making permitting easier. The property is in a remote portion of San Bernardino County in an active mining district. The site has three potential mining areas: Lookout, Cliff and the Santa Fe group. The Lookout has potential for a small open pit. The Cliff can be selectively mined underground or as a cut and fill operation. The Santa Fe group must be mined underground due to extensive overburden. This estimate is based on applicable mining methods, mining limitations and environmental restrictions imposed by the State of California. Blackhawk mines are located in the east – west trending thrust zone in highly hydrothermally altered granites and carbonates adjacent the Old Woman Springs sandstone. The geology indicates evidence of the occurrence of a possible Olympic Dam type base and precious metal deposit. The Olympic Dam is a world class Cu – Au – Ag deposit in Australia. An Induced Polarization (IP) Survey would be warranted to determine the presence of a possible deep seated ore body. See the Mark Coolen on the Olympic Dam similarities document. Recent sampling by Dr. Erik Melchiorre of Calif State University – San Bernardino indicate zones of half ounce gold and high silver values. These testing results are available upon request. Gold was discovered at the Blackhawk in late 1870's. A 10 stamp mill was operating in 1890. In 1921, the Blackhawk Mines were reopened as the Arlington Mining Co. In 1924, President Calvin Coolidge signed the patent papers for the current Blackhawk mines properties. By 1931, the underground workings totaled 12,000 feet in length, Nine other tunnels varied in length up to 200 feet in length. In 1938, the Arlington Mining Company was sold and renamed the Santa Fe Gold Mining Co. The mine and mill were expanded and the largest gold production was in 1939. The mine closed in 1941, as most gold mines did during WW II. A large amount of documentation is available on the Blackhawk since 1882.